I had a rare experience at the theater yesterday - I went to see a musical I knew nothing about and was absolutely charmed by it. Stephen Schwartz's Wicked may be the 10th longest-running show on Broadway and one of the most "popular" musicals of recent years, but his 1976 musical The Baker's Wife never made it to Broadway and is rarely produced. I'm grateful that Artistry's resident Music Director Anita Ruth was finally able to do her "dream show," and what a dream it is! The absolutely lovely score, the touching story about love and forgiveness, and the cast, led by everyone's favorite Bradley Greenwald and soon-to-be everyone's favorite Jill Iverson, make this a dream show indeed. Head to Bloomington before November 12 and take a chance on an unfamiliar musical, you just might fall in love. The story reminds me a little of my favorite Johnny Depp movie, Chocolat. But instead of a chocolatier and her daughter arriving in a small provincial French town to shake things up, a baker and his wife arrive in a small provincial town to shake things up. The town baker died a few weeks ago, and what is a French town without fresh bread?! 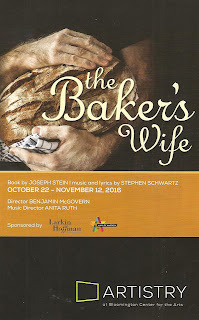 The new baker surprises the townspeople with his significantly younger and prettier wife - what is she doing with him? We soon learn that Genevieve has some trouble in her past, and Aimable is kind and good, and he loves her and treats her well. It's a sweet and tender relationship, but Genevieve feels something is missing, and frustratingly runs away with the handsome young Dominique the minute he asks her. In despair and disbelief, the baker starts drinking and stops baking, to the dismay of the town. They go in search of the baker's wife to bring her back, and what follows is a poignant and lovely story about realizing what love and forgiveness truly mean. Bradley Greenwald (a veteran of Twin Cities stages who's already proven there's nothing he can't do) is a dream as Aimable, so sweet and charming, hilarious when playing drunk, and that indescribable unmistakable swoon-worthy voice! 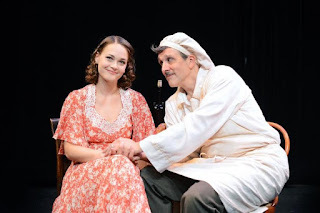 As the titular baker's wife, Jill Iverson gives a star turn. She's always fantastic in whatever supporting role she's playing, but it's a thrill to see her truly shine in the spotlight. Her rendition of the most famous song in the score, "Meadowlark," is a stirring highlight, and she makes us empathize with Genevieve even when she breaks sweet Aimable's heart. For not even Philip C. Matthews' considerable charm can make Dominique anything other than a spoiler in this couple we're rooting for. With every fiber of my being I wanted her to see him for the shallow selfish man he is and reject him. But that wouldn't make for a very interesting musical, would it? The strong ensemble cast plays all of the colorful townspeople (although sadly, not so colorful in terms of ethnicity). They sound gorgeous singing this dreamy romantic French-infused score (that might become one of my new favorites), especially the lovely Aly Westberg as she opens the show with a song about chance and change. Aforementioned Music Director Anita Ruth has beefed up the orchestrations for a lush sound coming from the 15+ piece orchestra. The story is a bit old-fashioned, and there is some uncomfortable misogyny (several of the men are cruel to their wives, and everyone judges Genevieve, first simply for being young and pretty, then for running away with another man). But like in Chocolat, the women are inspired by Genevieve going after happiness, even in the wrong place, and some make similar changes in their own lives. The little town has changed because of the arrival of the baker and his wife. 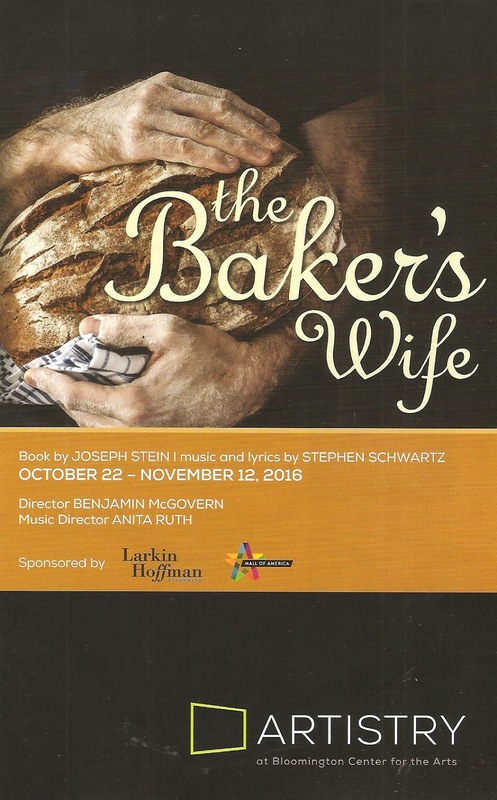 The Baker's Wife continues at Artistry in Bloomington through November 12.